The poppy has a long association with remembrance. Scarlet corn poppies (papaver rhoeas) grow naturally in conditions of disturbed earth. In late 1914, the fields of Belgium and northern France were ripped apart as WW1 raged through Europe. 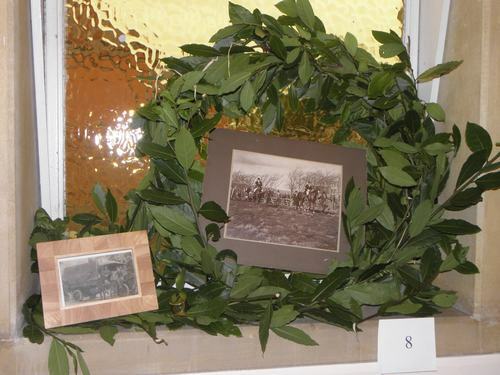 Once the conflict had ended, the poppy was one of the only plants to grow on the battlefields. The significance of the poppy as a lasting symbol of memorial to the fallen was realised by Canadian surgeon John McCrae in his poem 'In Flanders Fields'. 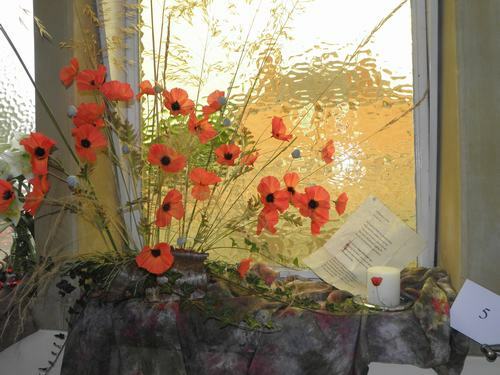 The poppy quickly came to represent the sacrifice made by his comrades in WW1 and later conflicts. The Royal British Legion adopted it as the symbol for its poppy appeal after its formation in 1921. 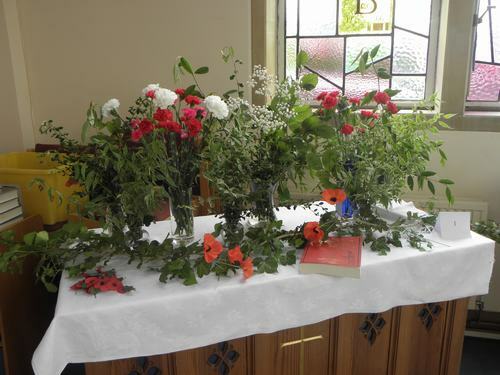 Sarah has used black mondo grass (ophiopogen planiscapus or black lilyturf) and scarlet coloured geranium to recreate the poppy image. Chris is remembering all the Animals that man forced to go to War, but is paying particular attention to our four legged friends. Faithful in War as in all other respects. 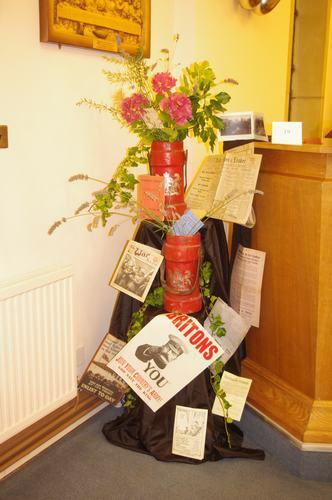 Shell Carriers, Old Newspapers and Posters all add to the dramatic effect with this display, tucked away in a corner, just as they might be in the Attic. 'Woodbine Willie' FIERY GLOW IN THE DARKNESS. This is the title of a book about Rev. G.A. Studdert Kennedy written by Michael Grundy. Both sides initially used aircraft for reconnaissance over enemy positions. Inevitably, the two sides started shooting at each other to stop observation, and the air war was born. 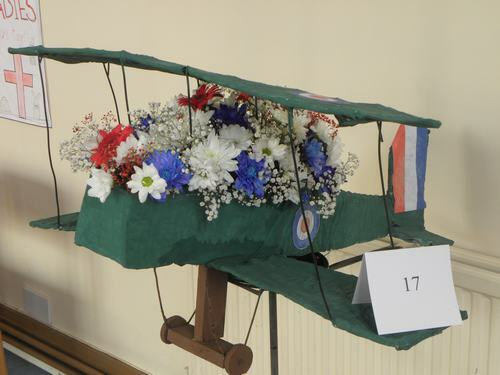 14,166 Royal Flying Corp pilots were killed, although most died in Training Accidents. 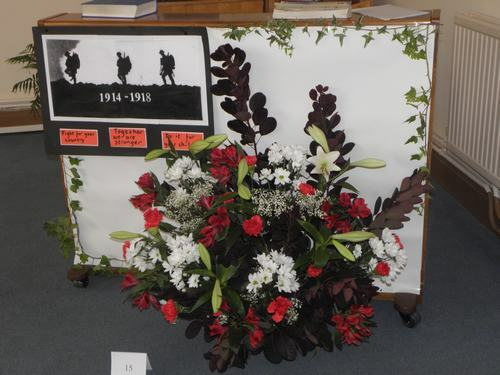 A beautiful display of Flowers in Commemoration of all those who fell in the First World War, along with a book about the "Wipers Times", a British Trench Newspaper. 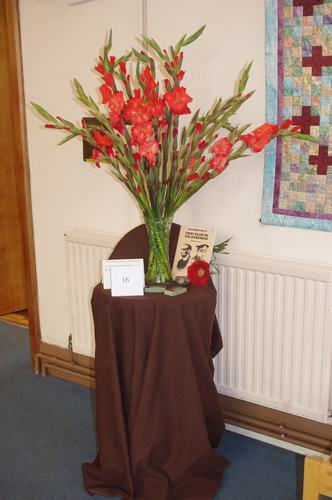 A Tribute to Doreen's Father who was held in a German Prisoner of War Camp, and to John's Uncle whose Cross is displayed. The Name and Pictures say it all as Jean pays tribute to this famous Scottish Regiment. 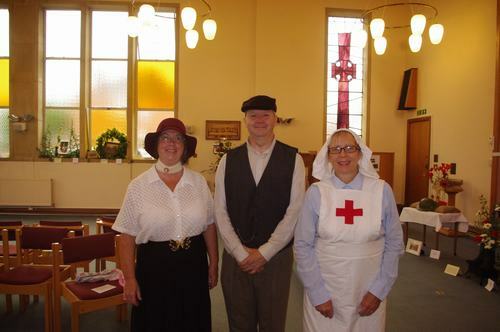 The horrors of the Trenches imaginatively re-created, complete with barb-wire and muddy dug-outs. A heart rending interpretation of the famous poem by John McCrae. Brought to life in vibrant colour. 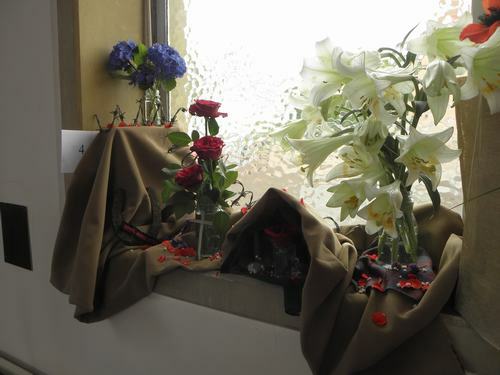 Reasons that Men to go to War are examined in Rosemarys thoughtful and dramatic display. Over 500 British Royal Navy ships were lost at sea during the First World War. Many ships were lost to U-Boats while protecting Merchant Shipping. 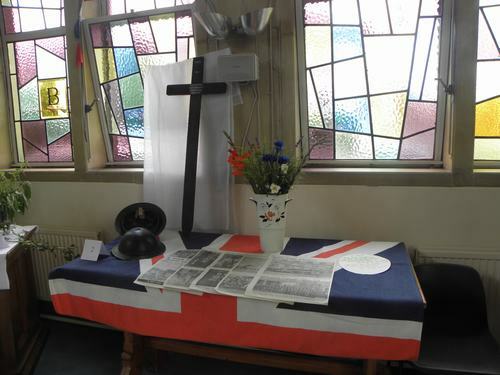 This display pays tribute to all the Naval Casualties in WW1, and the many Merchant Seamen who were also lost while keeping the home countries supplied with food. Another superb depiction of the Poppy Fields of Flanders. 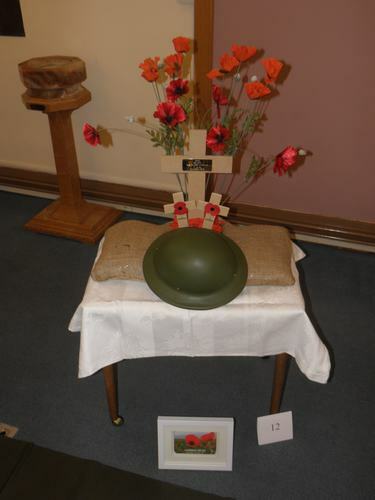 With an old Soldiers Helmet and a Cross to bring home the tragedy of War. 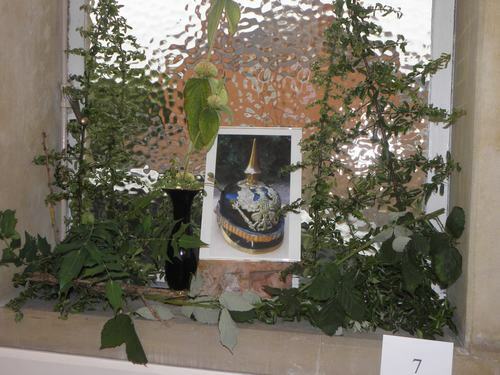 The inspiration for this piece is taken from Rupert Brooke's poem 'The Soldier'. The opening lines read 'If I should die, think only this of me: That there's some corner of a foreign field, That is forever England'. Brooke, who was born in Rugby, attended Rugby School and King's College Cambridge, where he became a fellow in 1912. At the start of WW1 he was assigned to the Royal Naval Volunteer Reserve. The action he saw at Antwerp inspired the writing of his passionately patriotic sonnets, the last of which was The Soldier. He was at the height of his fame when he died during the war aged just 27. He was on his way to serve in the Dardanelles (in modern-day Turkey) when he died of blood poisoning on the island of Skyros, Greece where he was buried. 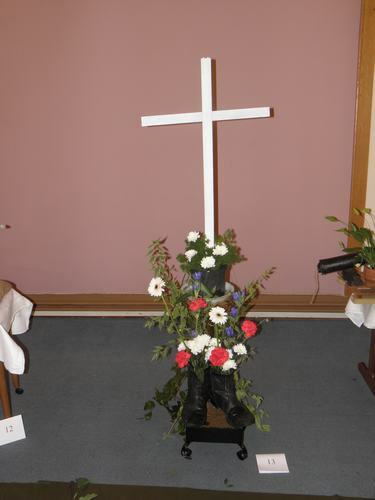 Hannah has arranged her flowers in a pair of boots alongside a white cross to symbolise the many young lives lost in WW1. 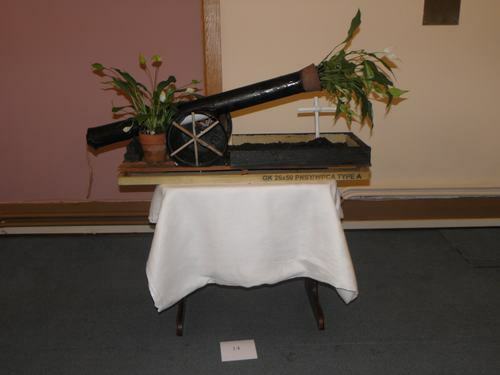 Artillery guns had a huge impact in WW1. Along with machine guns and poison gas, they played a prominent role in the trenches, especially at battles such as the Somme and Verdun. 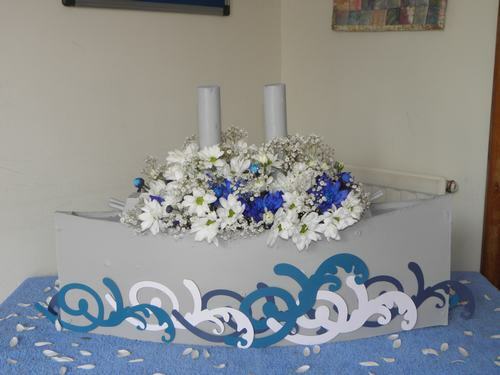 The peace lily, a symbol of peace and hope, is traditionally sent in sympathy when a relative dies. It symbolises the rebirth of the soul and transcendence from this earthly life. 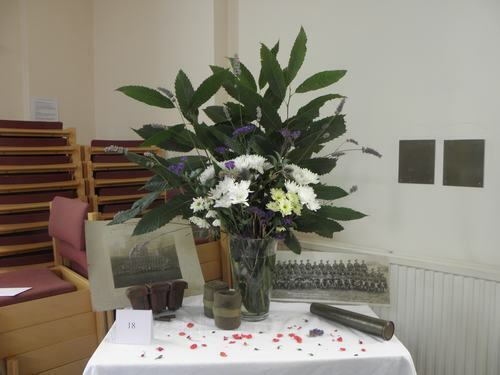 In this display Kirk has contrasted the two as both a tribute to the fallen and a symbol of hope that there will one day be peace on Earth. 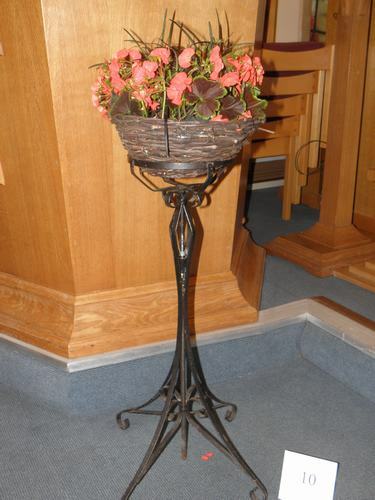 This arrangement is inspired by the principled stand taken by conscientious objectors. During WW1, women were encouraged to give white feathers to men at home in order to shame them into enlisting. 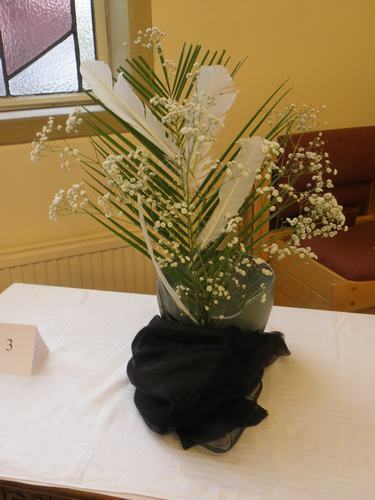 Robert has used a palm leaf and white gypsophila to create a feather. The title is taken from Wilfred Owen's poem of the same name which was published in 1920 after his death in action in France in 1918. Owen's realistic poetry on the horrors of war stood in stark contrast to the patriotism of other war poets such as Rupert Brooke. In the final verse of the poem, Owen refers to 'Dulce et decorum est pro patria mori' (it is sweet and honourable to die for one's country) as 'the old lie'. 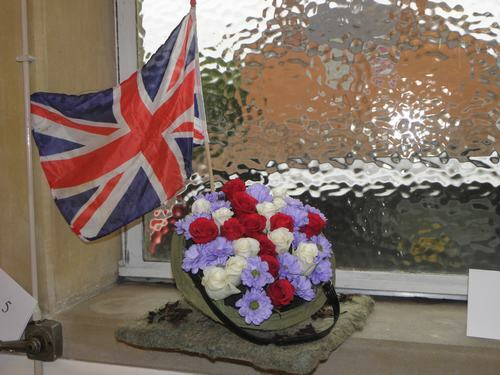 Nature blooms from a fallen helmet in this thoughtful display, all under the shadow of a Union Flag. In memory of my Opa who Martyn remembers seeing a photograph of as a lad wearing a child's Prussian military uniform and helmet such as this one. Unfortunately we could not find the photograph. We suspect my mother returned it to the family in Bavaria. First picture is circa 1920 : first horseman is Major David and person leading the horse is Sam Moore. Second Picture - The Major is pictured in 1914 standing on the truck in the photograph in the display. Sam is stood next to the wheel of the truck. Also included in the display is the Major's snuff box. 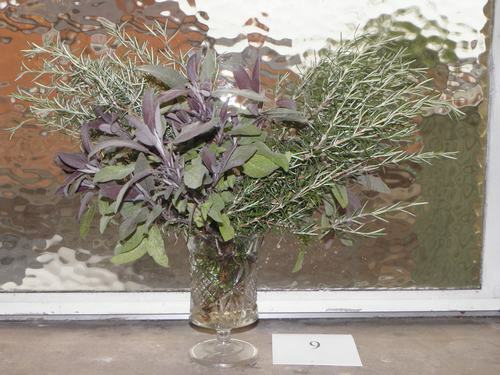 Lucas has used Rosemary and Sage which signified Remembrance and Commemoration in a time gone by. 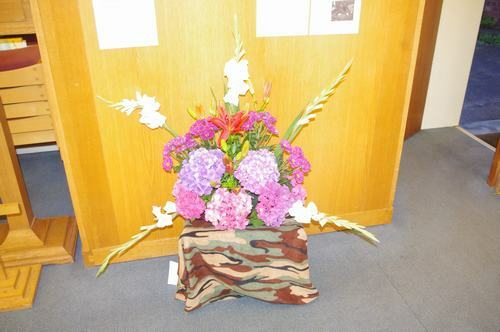 Representing the Mothers and Fathers left waiting at home for news, and the countless civilians who served as VADs and other support staff.